The railroad is not insular. It interacts with industry and environment. And it interacts with people. 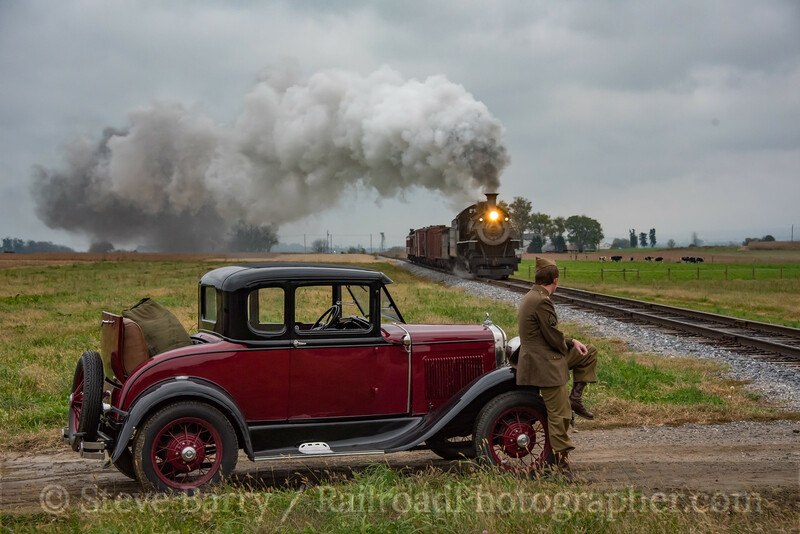 As part of the charter on the Strasburg Rail Road hosted by Lerro Productions on November 6, 2017, the trains of the past were enhanced by bringing in some people of the past. 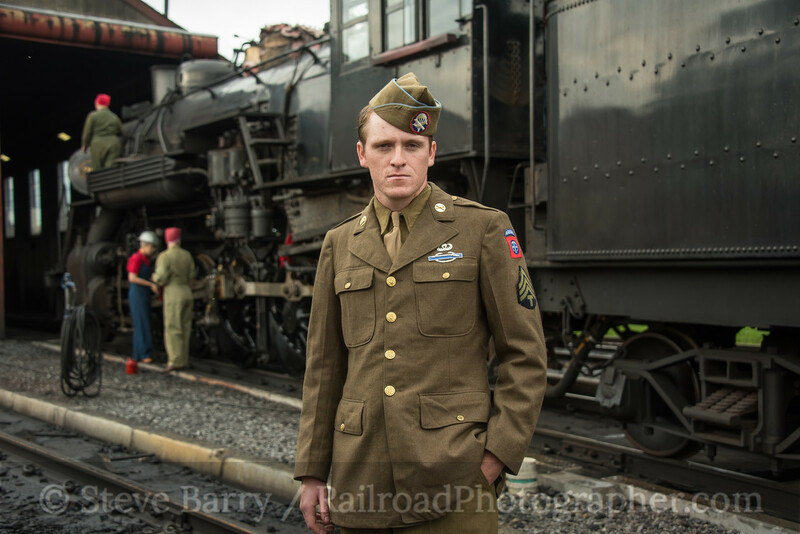 One of the most interesting times in the era of steam railroading was during World War II. The railroads were busier than ever. Christopher Brang posed as a soldier of the War at the Strasburg shop (above), as well as out on the line with Nicholas Brightbill's Model A Ford (top photo of this post). During World War II, women were pressed into service on the home front, taking over some industrial jobs while the men were deployed on two fronts. These women were represented in wartime posters by "Rosie the Riveter." For the charter, we had our own group of "Rosies" working in the Strasburg shop -- left to right we see Erin Kuntz, Cassie Giunta, and Jenny Wiese with Strasburg's ex-Great Western 2-10-0 No. 90. 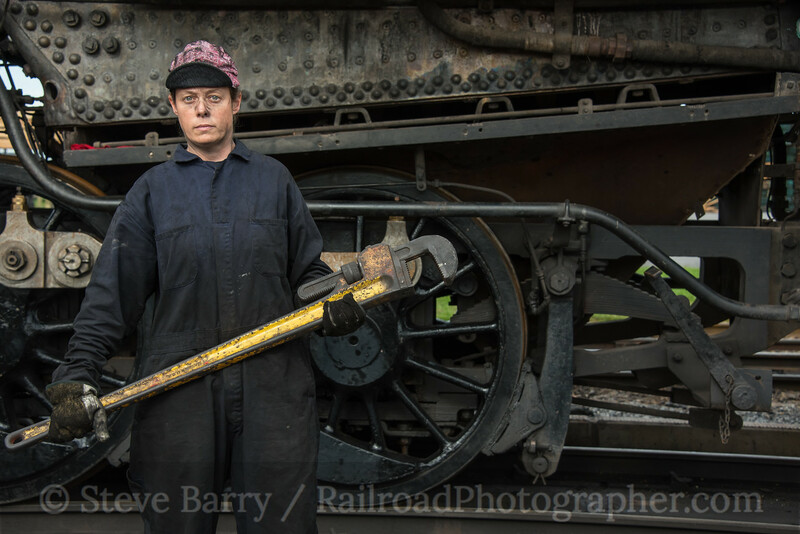 Also in the Strasburg shop, but not a re-enactor, was Shelley Hall, an employee of the railroad. She had the unenviable task of working in No. 90's smokebox on this day. 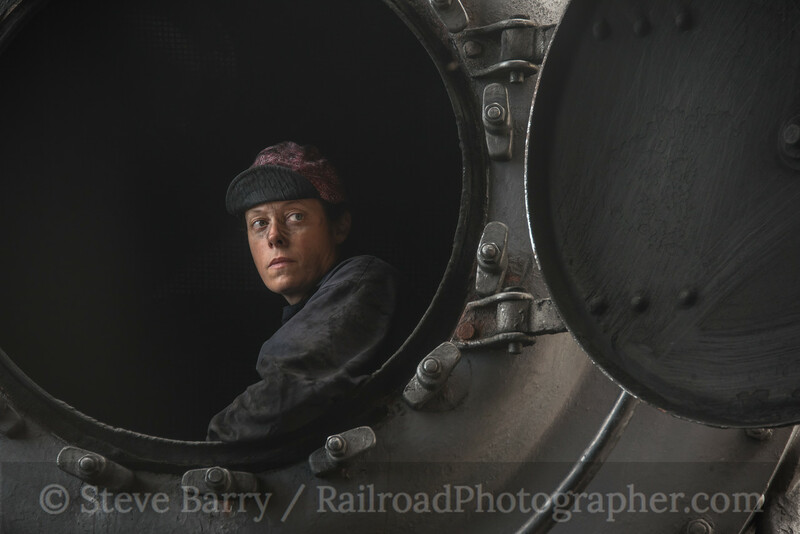 Showing how timeless steam railroading is, her 21st-century work looked right at home compared to the 1940s recreations. Erin pauses at the door to the Strasburg shop. Our group of Rosies certainly gave their all in making the hard shop work come to life. 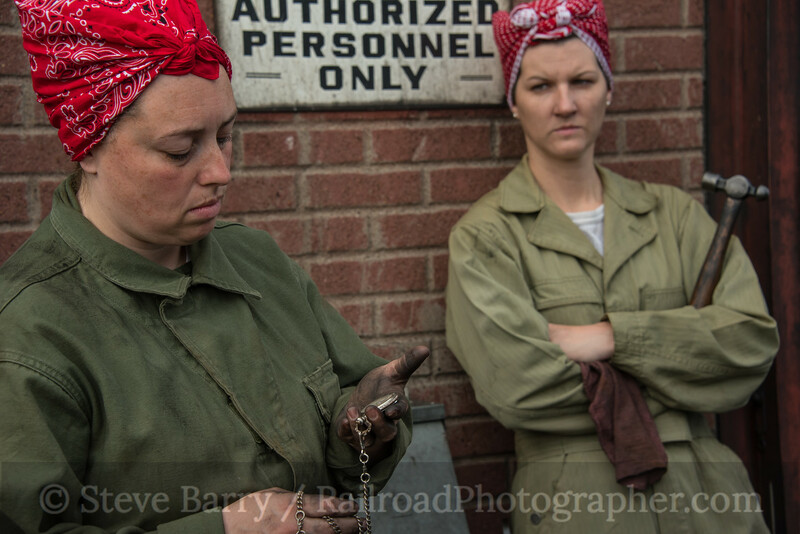 We see Cassie and Jenny looking pretty hardened by the hard labor in the shop. Shelley took a break from work to also pose for a few shots. We see her with No. 90 and one of the largest wrenches she could find in the shop. After lunch, Jenny and Cassie portrayed a much more pleasant scene from the 1940s as two passengers waiting to depart from the depot. 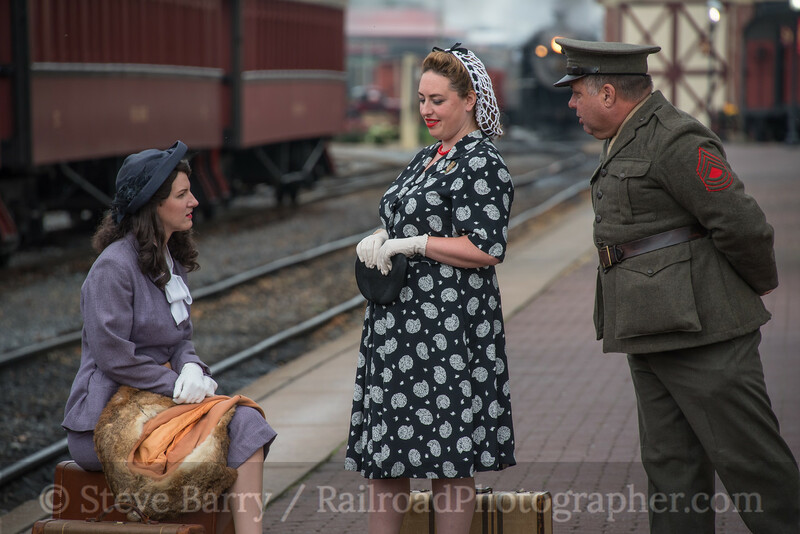 A soldier portrayed by Tim Kuntz leans in to converse with the two ladies. 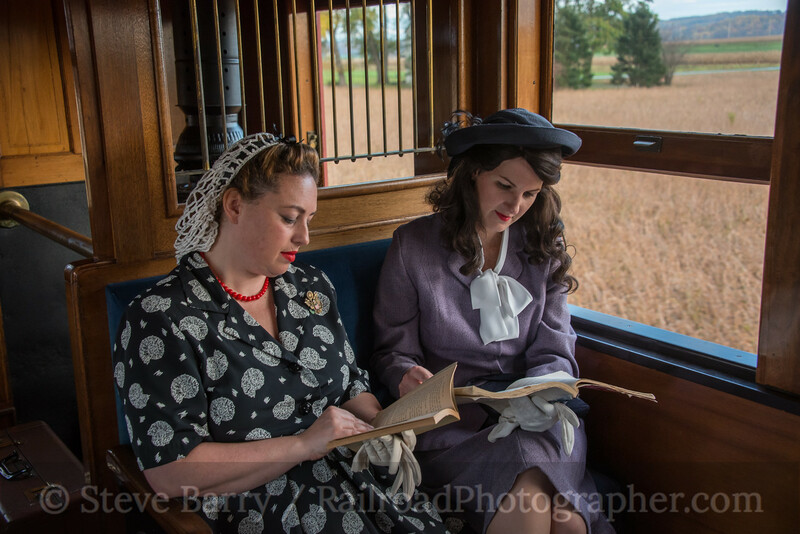 Cassie and Jenny also rode the train through the Amish farmland outside of Strasburg. Your photographer had to change his angle just a bit on this shot when another photographer in 21st century clothing and carrying a tripod suddenly appeared outside the window. 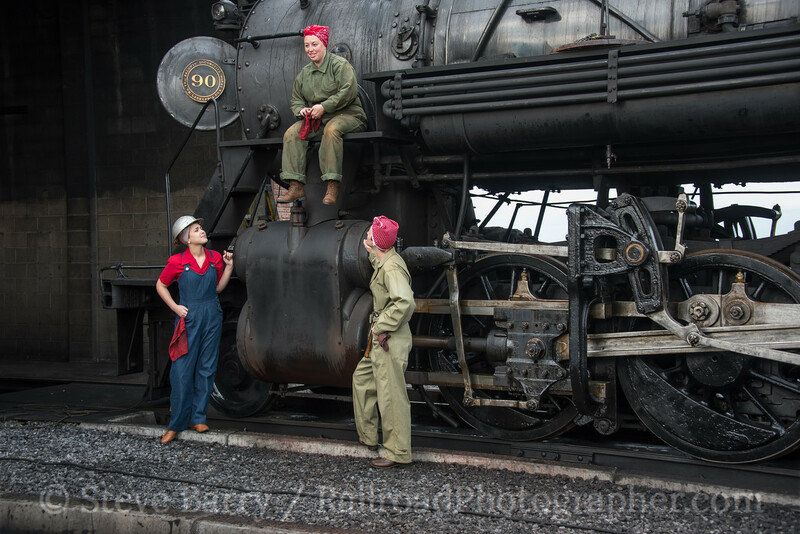 Finally, after dinner, Jenny and Cassie returned to their "Rosie the Riveter" dress for some final shots with Strasburg's ex-Norfolk & Western 4-8-0 No. 475 (made to look like N&W 382, which we chronicled in the last installment). 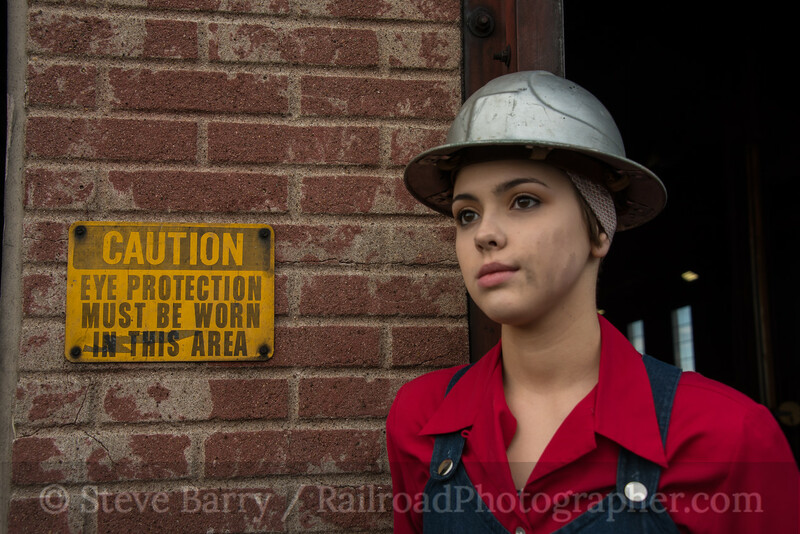 Some railroad photographers only focus on the equipment, but people bring the past to life.